Internal savings of £60K in first 6 months. Dundee City is the 4th largest in Scotland and the Council is making great strides towards sustainability. Bryan Harris, the Sustainability Manager at Dundee City Council launched their Warp it system in Oct 2013 after hearing about it in a Tayside Procurement Partnership meeting. I convened a small group of staff from Property, Waste, Procurement, I.T. Sustainability and agreed phased implementation. This helped us iron out issues and correct course if anything came up. As well as making internal savings, Dundee City Council also donated assets to other Councils , Universities and the 3rd sector. Staff also claimed assets off other organisations. Almost all staff that have claimed items and that I have talked to said "I wish we had this years ago". Dundee City Council have developed stronger relationships with other local organisations like Dundee University. 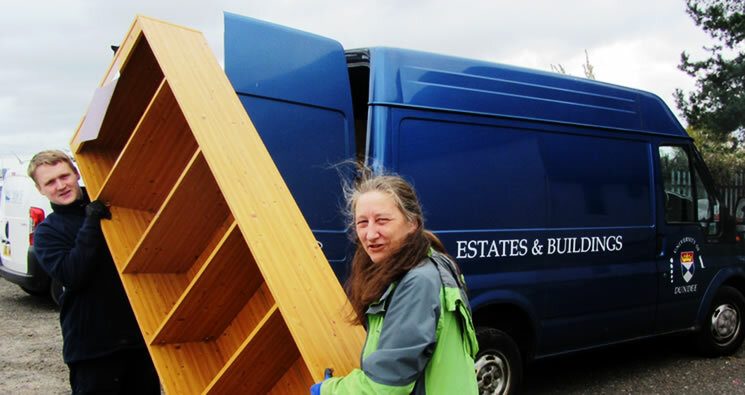 In this picture we see Trudy Cunningham and team collecting surplus items. The difference with Warp it to other reuse/redistribution practices is the provision of data, the more accurate the better. Information is king!. This is what gets the attention of managers. I scribbled a totaliser onto a piece of A4 paper and stuck it on the wall behind my desk. I didn't think I would get so much joy in getting the highlighter out to colour in each £1,000 saving! Total procurement spend avoided. Note the seasonal fluctuation. The beauty of this piece of work is that it genuinely combines some of the Council’s top priorities: reducing waste, saving money and supporting local groups and communities. The team proactively identified an innovative approach that delivers a meaningful and measurable outcome. They had the drive to make it real, the attention to detail to ensure that it works and created a network of supporters needed to secure a corporate and cross-departmental commitment. By overcoming the scepticism and resistance which can scupper change, this project can genuinely help to make the Council financially and environmentally sustainable. There is an independant case study for this project by Keep Scotland Beautiful here.